Who will design Adele’s wedding dress? Rumour Has It (see what we did there?) that superstar and new-mum Adele has narrowed down her wedding dress choices, even though she hasn’t confirmed her engagement just yet, and designer Jenny Packham is top of the list. The British designer is loved by stars including Kate Middleton, and was last worn by the singer at the Oscars. 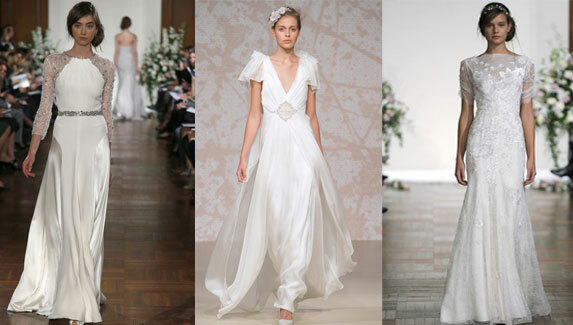 And even though Jenny Packham won’t comment on whether the two are talking, we’re already excited about the prospect of that collaboration, so we picked three dresses we’d love to see her in to wed her beau Simon Konecki. Now, we know Adele, mum to six-month-old Angelo James, favours high necklines, romantic textures and fabulous embellishments, so we’d love to see her in something like this first number – the soft lace and jewelled waistline are gorgeous. Though a deep V or scoop neck with draped shoulders would also show off her signature bouffant ‘do to perfection. We think we’re most likely to see her in something like this last dress. With three-quarter sleeves, an embellished nipped-in waist and gorgeous, feminine lace, we love it. But let’s be honest she couldn’t go wrong with any of them.